Masking traditions were once found in many parts of Borneo. The fanged, hook-nosed masks of the Ngaju worn during death rituals (tiwah), the elaborate curvilinear deity masks of the Apo Kayan, and the famous composite animal masks (hudoq) of the Bahau used during agrarian festivals all attest to the quality and variety of Dayak masks. Among the Iban, the use of masks has traditionally been less ambitious and is associated either with protecting crops or with entertainment. Though they generally have played a minor role within longhouse life, indoor masked performances often exhibit the prankish humor of the Iban. Indai guru' is a spirit who lurks in lofts and along the far reaches and edges of the longhouse. An older female impersonates here, and with skillfully performed theatrical gestures, attempts to scare children, who, terrified, run shrieking into the protective arms of their waiting parents. As late as the 1970s, the arrival of a guest from far away, or the ending of a ceremonial cycle (berbuti), often called for tension-releasing dances that made use of these masks. Once again, older females wearing sacklike clothing would perform to the tremulous beat of gongs. The most proven men (as well as male guests) were playfully accosted and teased by Indai guru', who was allowed to harangue their masculinity, often with ribald gestures. It was a classic play on role reversal. At first seemingly tense, the entire affair quickly turned into a comedic farce. Chaos was created and balance within the longhouse was temporarily threatened, only to be righted and cleansed by doses of human folly amid peals of laughter. In general, Iban masks often seem to have been hastily worked. Perhaps this is because they were made more for pleasure than actually being the focus of a ceremony characterized by extreme competitive tension. In addition, Iban masks were not made solely by a class of experts. Crude execution may also have been intentional so as to accentuate a mask's ghostly qualities in an era before kerosene lamps and incandescent light. Antique masks usually have a natural surface or are painted black with areas highlighted in white. Generally, they display abraded areas, and, depending on the hardness of the wood, concentrations of patina develop with use and age. Qualitatively, this older Indai guru' mask is exceptional, as it was carved by a very skilled hand. While balanced and even stately, its parted mouth, bared teeth, long sallow face, and jutting chin effectively combine to evoke a sly and menacing persona. 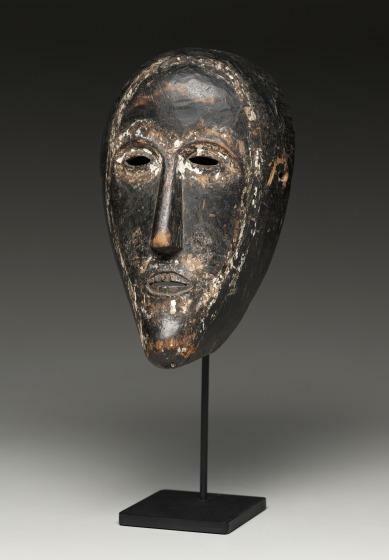 Steven G. Alpert, "Mask," in Eyes of the Ancestors: The Arts of Island Southeast Asia at the Dallas Museum of Art, ed. Reimar Schefold in collaboration with Steven Alpert (Dallas: Dallas Museum of Art; New Haven and London: Yale University Press, 2013), 144-145.